When Bistecca, an Italian-American steakhouse, opened in the lobby of 18 Parc Tower C in Jakarta’s SCBD early August, it immediately generated hype in the city, especially after TV reality star Dorothy Wang paid a visit to Bistecca with her wealthy Indonesian friends and posted their photo on Instagram. A month later, I was invited along with other media people to visit Bistecca. My alter ego as a citizen of urban society soared as I stepped into the must-eat-at place for Jakartans. The very first thing I noticed was the similarity of the façade to the trendy Caffe Milano. Once again I was intrigued. As the wooden and glass door opened and cold air blew from inside, as noise from the street gradually changed to the buzz of dining patrons and the clinking of plates and rushed waitresses dashed about, I knew I had entered Bistecca. The restaurant has a cigar lounge with leather couches that have a Churchill-look, gilded arched windows as a sign of a private dining room behind and spacious open kitchen. The right side has a bar that bears a similar tone to sibling restaurant Caffe Milano at Grand Indonesia. 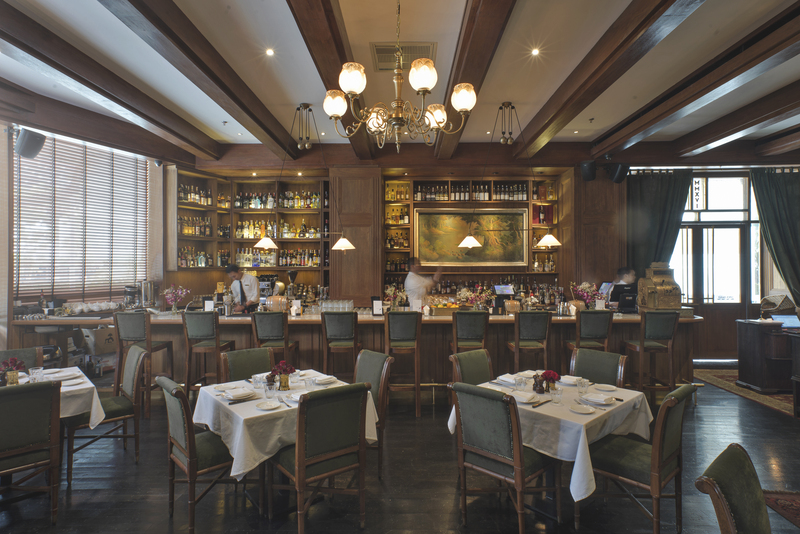 Beautiful paintings and nicely arrange lighting elevates Bistecca’s bar to a higher stature. As we sat on the comfortable swamp green velvet chairs, chef Luca Perezza, the patron chef of Bistecca — and Caffe Milano, yes again — greeted us. We began with a Caesar’s salad, which was an understated item on the menu. Skepticism was put to an end when a waiter brought to the table on a guéridon a wheel of grana padano cheese, which is similar to parmagiano reggiano. The wheel was half hollowed out and a bowl of lettuce, house mayonnaise-based sauce and crispy anchovies had been placed in the hollow. Then in a gentle move, the waiter’s left hand scraped the cheese into the bowl as his right hand stirred the ingredients together, resulting in a Caesar’s salad with the intense flavor of 24-month old cheese. A sublime salad fit for Caesar himself. Then with eloquent moves, a waitress brought to our table a huge round plate containing six pieces of ravioli emitting a scent of truffle. Ten minutes later I was still indulging myself. I was bedazzled. A dish is almost poetic when each flavor works in a provocative way or works in the most eloquent manner where every component balances the others. What is this food that I just put into my mouth? I wondered. What is this beautiful art of ingredients where bitter and umami creamy, aged parmesan sauce with a hint of smokiness from mozzarella dance with green basil oil bathed pillows of delicate ravioli that contained a classical repertóire a la Français, foie gras. Such taste and deliciousness is almost as ecstatic as an orgasmic sensation. What was that? What was this dish that summoned almost all of my expression of joy of eating good food? I then realized that it was just a humble creation of chef Luca Perezza of Bistecca, ravioli. But there is one thing for sure, I encountered one of the most beautiful dishes, not in the essence of look but of flavor. While I was still enchanted with the divine ravioli, the grand dish arrived. It is the holy grail of Bistecca, the gargantuan, one kilogram “signature bistecca Fiorentina” (steak a la Florence). For the steak, chef Luca created a custom-made grill to cook the 45-day dry-aged beef. A handsome slab of chilled T-bone — never frozen — with just below 30 percent fat, it is as expected pure meaty goodness. Complete with hand-cut fries, a bowl of creamy spinach, a bowl of golden crusty, creamy macaroni and cheese elevated with the use of truffle and the final — yet the most important element of all — a good appetite. Each bite of bistecca Fiorentine convinced me that this was a barometer of the perfect chunkiness of beef. As for dessert, Bistecca presented a dish that used to be the cronut of Prohibition Era back in 1930s US -- baked Alaska. Baked Alaska is a famous dessert. It is both feminine with its white peaks of meringue and masculine from the burned rum or whiskey. The legendary Italian-American restaurant, Delmonico’s in New York, was famous for it. It is clear that Bistecca presents a handsome union of Italian cooking with American steakhouse persona. Whiles other dine at Bistecca merely for the sake of social status, I would gladly visit this handsome restaurant — again — purely because of the exceptional cooking of Luca Perezza. Bistecca is indeed Caffe Milano put into elegance.